How big will an emperor scorpion get in a 50 gallon tank? Planning to get one next week. How big will an emperor scorpion get in a 50 gallon tank ? Re: How big will an emperor scorpion get in a 50 gallon tank? 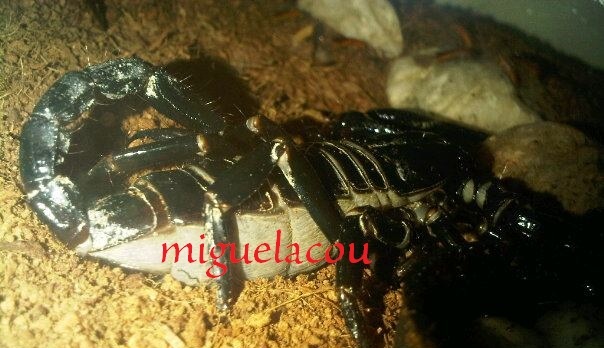 The Emperor Scorpion is a very large, impressive, and hardy scorpion from tropical Africa. Wild-caught specimens are usually collected in Togo and Ghana. It is also the one of the only species of scorpion that is known to be handled, yet this is not recommended. These scorpions are popular animals in scary movies, because they are big, black, and they can have close contact with actors. The venom is used infrequently, and is generally not harmful to humans. Emperor Scorpions have been traditionally kept in groups of three or more, as long as they are provided with enough food, but it is suggested to keep them in separate tanks. If there are a group of scorpions in a tank, many times fights break out for the same cricket, even if there are other crickets still left in the tank! As with most arachnids, it is important to keep your scorpion away from direct UV light. This species is especially sensitive to UV light, and such exposure will cause stress and ultimately death. Emperor Scorpions are a marvel of the "bug"-keeping world, and continue to impress collectors with their size and beauty. If you are choosing a scorpion, the Emperor Scorpion won't let you down. 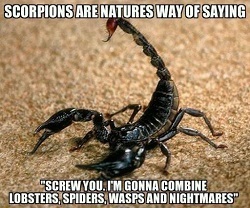 *Please note that ALL scorpions have a certain amount of venom. Although most people are not affected by this species, some people may be allergic to the venom, or just more sensitive, making it a dangerous situation. This is one of the reasons that people should not handle this scorpion. Affects of this scorpions' natural defenses may vary between people. All scorpions should be considered dangerous, so be careful, because you don't want to find out if you are allergic or more sensitive the HARD WAY! Thank you blue dave. Solved! !